Fundraiser • Utah politicians answer trivia in "game show." Cimaron Neugebauer | The Salt Lake Tribune "Jeopardy!" 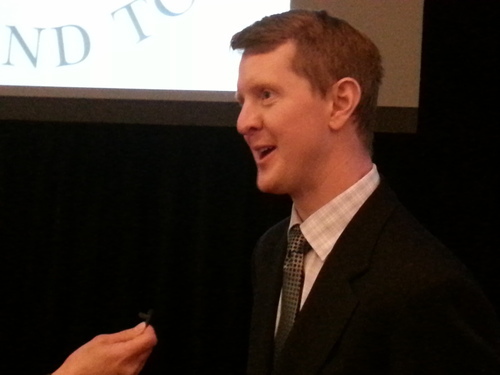 champion and author Ken Jennings visited Utah to host a mock game show held at the Salt Palace, with proceeds from the event benefiting charities. Cimaron Neugebauer | The Salt Lake Tribune "Jeopardy!" champion and author Ken Jennings, third from left, visited Utah to host a mock game show held at the Salt Palace, with proceeds from the event benefiting charities. Answer: It brings politicians from both sides of the aisle together to benefit charities. Question: What is the Utah League of Cities and Towns (ULCT) version of "Jeopardy!" On Wednesday, the 74-time "Jeopardy!" champion and author Ken Jennings visited Utah to host a mock game show at the Salt Palace, with proceeds from the event benefiting charities. Jennings, a former Utahn who now lives in Seattle, talked to 600 high school students from around the state before the trivia game about the value of learning and education. Later on Wednesday, he held a book reading for his new book, "Because I Said So," at The King&apos;s English Bookshop in Salt Lake City. "I&apos;m always to happy to visit Utah," Jennings said after the game. "I&apos;m always happy to talk to kids, that&apos;s my favorite thing to do. I said yes in a heartbeat." Senate President Wayne Niederhauser, R-Sandy; House Speaker Becky Lockhart, R-Provo; Salt Lake City Council Member Carlton Christensen; and Lt. Gov. Greg Bell were among those who competed on teams representing the Utah Senate, House, ULCT, and governor&apos;s office in a Utah trivia challenge. "It&apos;s a lot easier when you are on this side giving the answers," Jennings joked with those in the audience at Wednesday&apos;s event. The four teams went head to head in two rounds to raise money for The Road Home, The Homeless Youth Resource Center, the Boys and Girls Club of Utah Valley, and Utah&apos;s Special Olympics. In a nail biter, the governor&apos;s office team narrowly beat out the ULCT by 400 points to claim a $10,000 donation by Rocky Mountain Power to The Homeless Youth Resource Center. 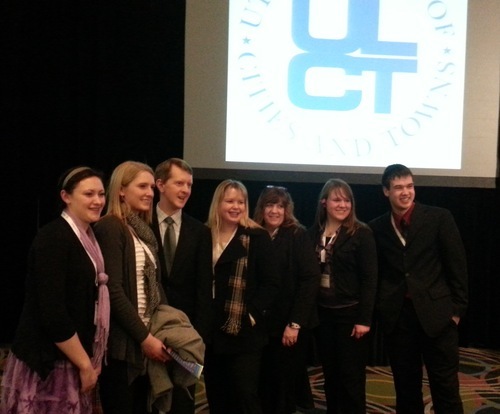 Second place went to ULCT, which earned $7,500 for the Boys and Girls Club of Utah Valley. The House won $5,000 for Utah&apos;s Special Olympics and the Senate won $2,510 for The Road Home. Michael Mower, Gov. Gary Herbert&apos;s deputy chief of staff, said the key to his team&apos;s win was timing. "There were a lot of people who knew a lot of things, the trick was making sure we all answered after Ken Jennings finished the question," Mower laughed after the game. While some of his competitors were sports and movie fans, Mower grew up in rural Ferron in central Utah. He loves history and has visited every town in the state. "Being in the governor&apos;s office, you learn a lot and meet a lot of folks," he said. Jennings jokingly assured the crowd and any lawyers from Sony Pictures Television it would be nothing like the well known game show. Daily Doubles were instead "Super Quiz boxes" and the iconic theme music was never played. "So as you can see, it is nothing like any syndicated TV show you have seen before." In fact, most players hadn&apos;t trained themselves to restrain from buzzing early until the final question. The hyper-active and incessant pre-mature buzzing led Jennings to at one point tell the contestants, "Wait, until the question is over. Parliamentary procedure people, please." After the game, Jennings said it&apos;s common to want to buzz in early, it&apos;s the biggest mistake on game shows. "As soon as you know the answer your reflex is to say, &apos;I know the answer&apos; because that is how life works, especially in politics, I assume," he said. On the real game show, if you buzz in early you are locked out from buzzing in again for a fraction of a second. "If you see someone on &apos;Jeopardy!&apos; just struggling with their buzzer, it&apos;s because they buzzed in early just like these people did," he said. The Utah League of Cities and Towns offers help on city issues and training for 245 incorporated municipalities in the State of Utah. Ken Jennings, former Utahn, "Jeopardy!" record prize winner and author will read and sign his new book Because I Said So. It unfolds myths and tales passed on through the generations.